Each day is commonly filled with the usual daily expected events and their outcomes. We are pleasantly surprised when occurrences surpass our expectations and we are suddenly catapulted into seeing a new reality for our lives although it may be short lived. Major news events that capture the international medias attention most often take place in metropolitan cities. Blaine, Washington however, has captured major media attention twice in less than six months. The most recent event involved a dozen police agencies and news teams from both Canada and The United States. 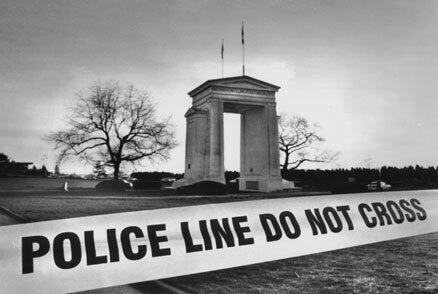 A commonly thought of site for a major crime scene would not be The International Peace Arch. However last week, two murder suspects, both of foreign descent tried to drive through the park going north bound on the south bound parkway to elude an array of ensuing police vehicles. The suspects car hit the Peace Arch just before a crash with a brand new police vehicle. A shootout with police officers ended this news scenario sending one of the men to a hospital and the other to jail. The park was closed for hours while investigations were completed and peace restored.